Zombicide! It's Popularity keeps on increasing. With over three million funding during two Kickstarter projects the number of zombies produced will, this September, reach epidemic proportions. This is in part due to the fantastically generous Coolminiornot Kickstarter projects, they haven't ceased to provide a bucket full of models for anyone purchasing their game publications through Kickstarter. Anyone simply investing in both seasons of Zombicide could probably swim in a vault filled with zombie miniatures Scrooge McDuck style (though I found it was not as fun as it looked). 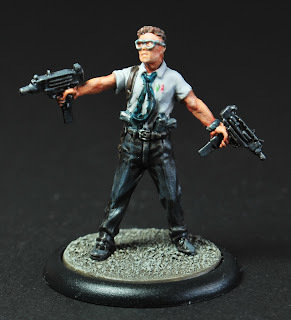 But I am here to talk about basing, or rather re-basing. As an old time wargamer and painter I am unshakably aware of the impact decent basing can have on a model. This is no less true for miniature boardgames, the atmosphere and investment in such a game is highly dependant on the pieces you are pushing around. You can weight up the urgency of shooting a grey lump of plastic to shooting a crazed rotten zombie dripping with blood, his lifeless yet fierce eyes bearing down on you, hungry for any taste of your flesh. To take it one step further, the imminent danger posed by a crazed rotten zombie stood on grey plastic is perhaps less than one stood on the same patch of tarmac as your alter ego survivor. Obviously there is only subtle shades of realism involved, but the more visual indicators the greater the experience must be, consciously or otherwise. Besides, some of the bases are utterly wobbly and just a pain to keep upright. From the get go I coated Zombicide bases in fine sand to provide a subtle texture that was painted in greys for an urban look. But had always considered fully re-basing the models. Unfortunately this is hampered, as the model and base for these figures is all one piece. Removing any one of these models is difficult and potentially disastrous re-basing any quantity of these models was a terrifying prospect in terms of time and modelling. So I wanted to base the models to look consistent and professional while maintaining the structural integrity of the models. But don't fret, the answer is at hand! Strangely enough the answer also appears to be produced by Coolminiornot, or at least produced in conjunction with Coolmini for Dark Age. So step forward ye delightful Dark Age 30mm Deep Bases. While these may be similar in overall design to Warmachine (they are in fact subtitled as such) and many other rounded 30 mm bases, they differ enough to be absolutely perfect for Zombicide. The fit is so ideal the models can almost snap-fit into place. With a touch of glue (Polycement was used in this instance, rigid plastic or super glue would likely also do the job) an entire set of Zombicide can be based in minutes. While the bases can be easily glued I wanted to ensure that any of the troublesome and wobbly bases were completed levelled. With the help of a few Bullclips each models bases could be viced in place while the glue would weld securely; I just left them overnight. 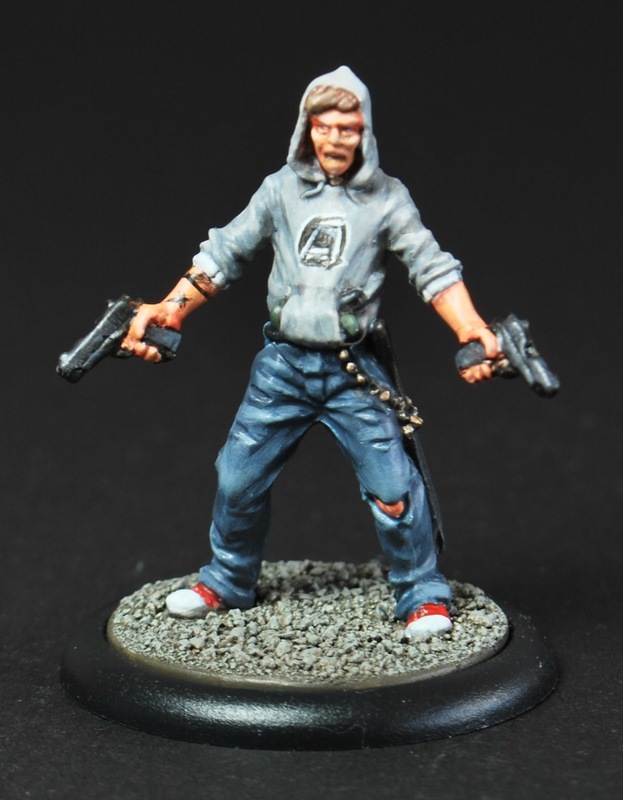 I ensured that the Zombicide bases were textured and painted (including the edging) before attaching them. This kept the rounded bases pristine as new avoiding any undercoating, paint, or basing materials. The level and flat stability these bases provide is a joy on the boardgame. Although, I have yet to test if a full Zombie swarm might be oversized for the board since packs of zombies form on certain street sections. I also need to test the larger 40mm Deep Base, the Abomination look fantastic on these! Photos of them coming soon. So here we have my latest almost finished painted Survivors (last minute details & shading needed) including shiny bases! Hopefully this will help peeps out there who were considering re-basing but wasn't sure how to go about it. 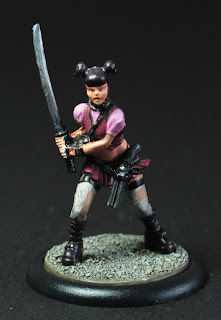 These bases will also feature as a option on my price list for any future Zombicide commissions. 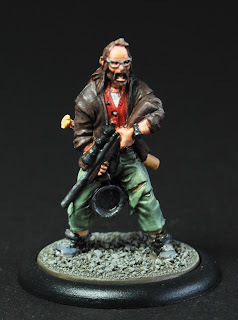 What material did you use and how did you paint the bases for the "gravel" look? Thanks! I just purchased these bases and they did not work. The depression was to small. Any other suggestions for bases?